I found this recipe from a Taste of Home recipe card my mom had. I adapted it to our tastes and made it a bit easier, too! My husband loves these and it is a race to get to the leftovers before they are gone! 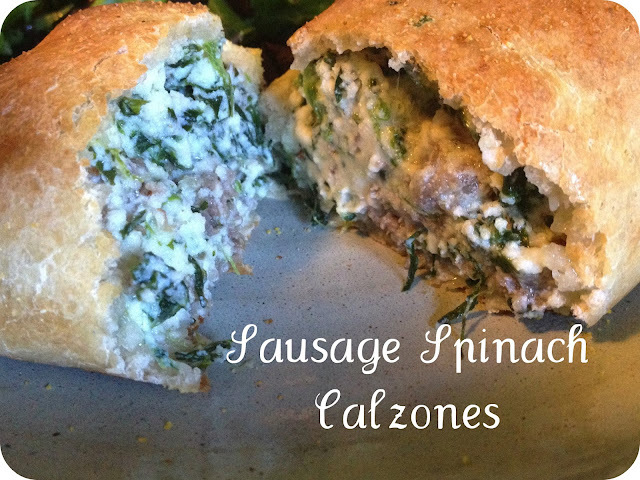 You will need a tube of refrigerated pizza dough (not the thin crust kind), 10oz package of frozen, chopped spinach, 1lb Italian sausage, 15oz. ricotta cheese (can be fat free) 2t. dried parsley, 1/2c. parmesan cheese, and a little bit of cornmeal and garlic powder. 1. Preheat the oven to 400F. Brown the sausage and drain off the fat. I ran water over my sausage to help get more fat off. Then, I thawed my spinach in the microwave then squeezed out all the excess water. 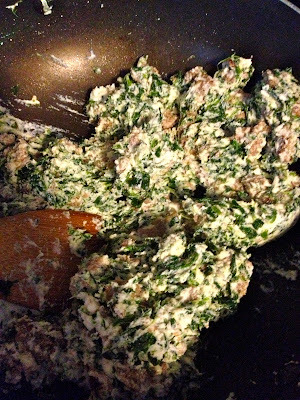 Of course I used my wok and just mixed in the ricotta cheese and spinach after I drained it. 2. Grease the baking sheet and sprinkle it with cornmeal. Then roll out your pizza dough on a cutting board and cut it into 6 even pieces. I kind of kneaded each piece so it was larger. Then I filled them with some filling and pinched it shut. 3. This is what they all look like once I was done. I sprinkled just a bit of garlic powder on top of each calzone. Bake them for 20-25 minutes or until they are golden brown. Serve with pizza sauce if desired. Check out I do deClaire on facebook! 1. Preheat oven to 400F. 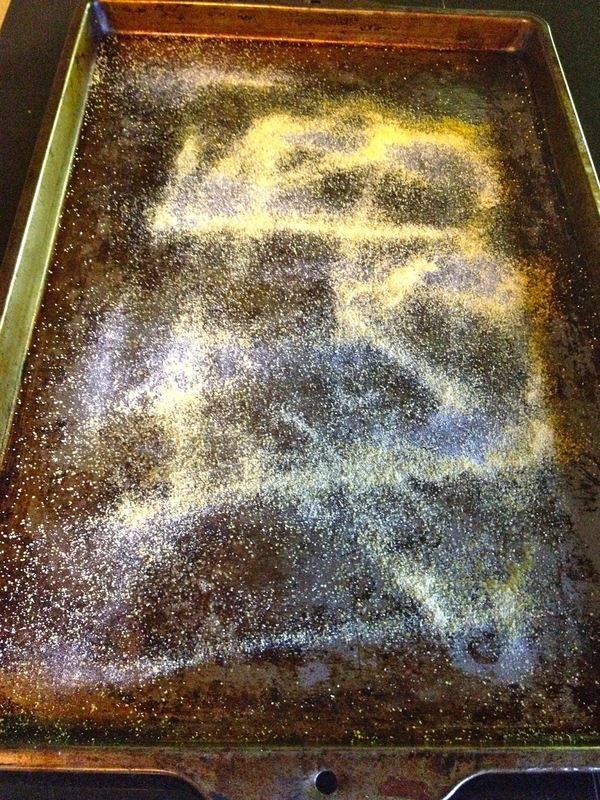 Grease cooking sheet and sprinkle with cornmeal. 2. Brown sausage and drain off fat. 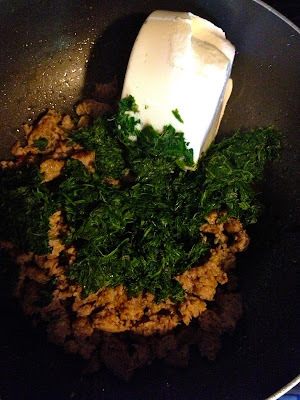 Thaw spinach and squeeze out excess water. Mix sausage, spinach, ricotta, parmesan, and dried parsley together in bowl. 3. Roll out pizza crust on cutting board and cut into 6 equal pieces. Knead each piece to make it larger and fill with sausage mixture. Pinch edges closed. 4. 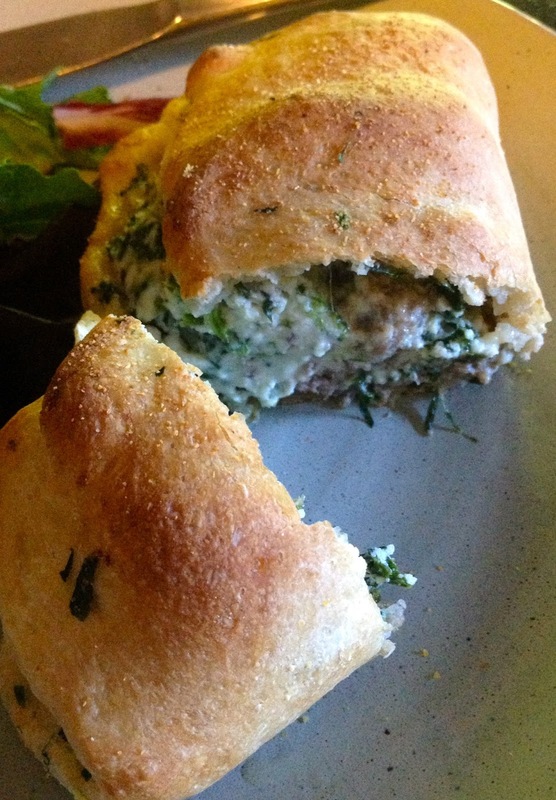 Place calzones on cooking sheet and sprinkle with a little bit of garlic powder. Bake for 20-25 minutes or until golden brown. Serve with pizza sauce if desired. I make pizzas all the time (with my own dough recipe), but I've always wanted to try calzones as a way to mix it up. These sound amazing! You can actually find it in this post: http://fairywingsmakegoodsoup.blogspot.com/2013/06/white-pizza-chicken-with-alfredo-sauce.html !